When I workout, I sweat. Like it drips from everywhere. I like a good sweat. Love it, actually. But I don’t love my stinky gym clothes that comes with it. I was starting to be embarrassed with how smelly my clothes were and felt like I needed a whole new wardrobe. Since new clothes would have been a pretty expensive option, I decided to first do a little research and see if I could fix the problem myself. Luckily, I found a few tips and I’ve been doing this combination for a few weeks now and it seems to be working! The texture of my workout pants have even changed- they’re softer and less stiff, more similar to how they were when I first bought them. And the best part- they don’t smell! 1. Fill up an extra tub with enough water to fully cover the clothes. Add vinegar, aiming for 4 parts water to 1 part vinegar and mix well. 3. Use laundry detergent with febreeze. I’m usually not a proponent for these types of products but it’s helping, so I’m sticking with it for now. 4. After at least 30 minutes of soaking, ring out gym clothes and place them in the washer. Add half the amount of laundry detergent you need and use baking soda for the other half. Wash clothes on the hottest water temperature. 5. Hang to dry. Preferably, outside in direct sunlight or a well ventilated room. I was pretty skeptical that anything would help but I’m so glad I found something that has. Are your workout clothes smelly? Do you have any tricks to help eliminate the odor? I’m a believer in date nights. They don’t have to be anything elaborate but simple nights that get you out of your routine and away from the tasks you have to do around the house. They give you a break from the kitchen and dishes and give you an opportunity to reconnect, in a way. Usually once a week we go on one. 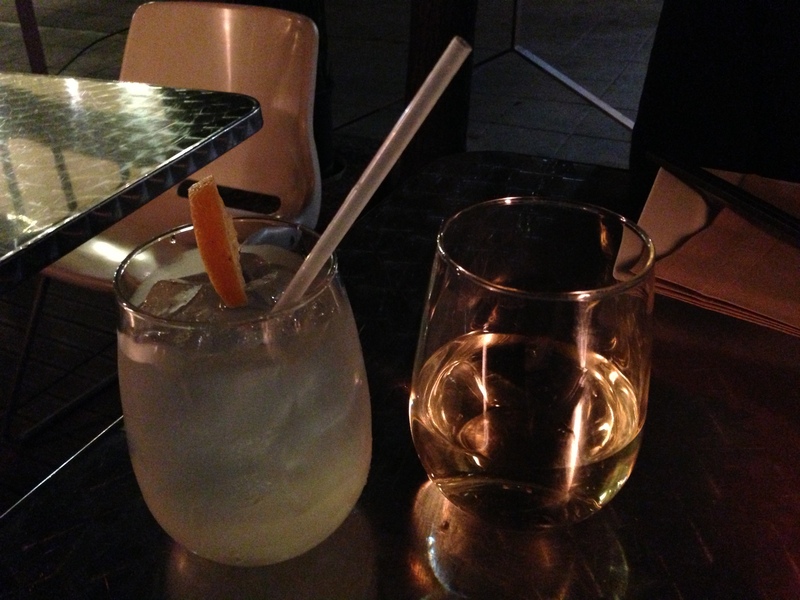 Lately it has been a leisurely dinner out and sometimes a glass of wine or a cocktail too. 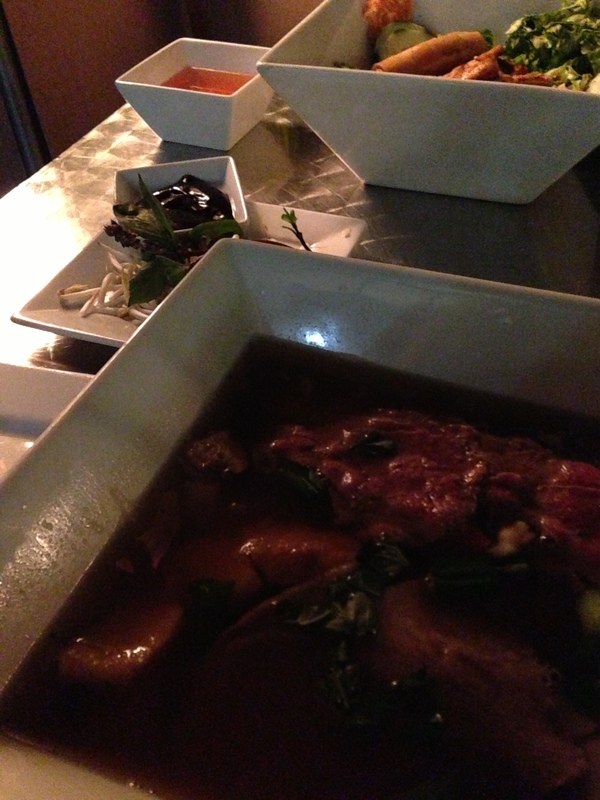 One of our favorite places is Number Nine in Long Beach for Vietnamese food. We used to live within walking distance which made it even more fun and convenient. I love not having to drive. It’s located in an area on 4th Street called “Retro Row” where there are a number of vintage shops which are fun for browsing. A couple restaurants in this area have created parklets which are becoming more popular throughout Long Beach. For those who aren’t familiar, it’s when a parallel parking spot(s) is taken over to provide either a green space for passive or active recreation or some other amenity to enhance the pedestrian experience on the street. The designs for these spaces vary and can be quite innovative. However, often the design is somewhat temporary and could be removed in case of an emergency. For a street that has shops, wine bars, restaurants, galleries, and an independent movie theater all within one block, before the two parklets, there was only spot for outdoor seating. Therefore, the street was mainly used for walking and there was little on the street level to engage the pedestrian. These parklets have helped to activate the street by making it more dynamic and lively. Personally, I always enjoy walking down these types of streets. Number Nine is one of the restaurants that has commandeered the parking spot in front of their restaurant and created outdoor seating. There are heat lamps, pedestrian height lights, wood panels so the ground level is the same height as the curb and has a restaurant feel, and bamboo planted in containers to create a hedge and help to provide a separation between the dining space and the cars passing by. This picture below is an older picture, the bamboo has matured even more and really does create a nice screen. The entrees are flavorful, filling and reasonably priced. The menu is fairly simple- various flavors of Phở (rice noodle soup), Bún (cold vermicelli rice noodles with egg roll), and Bánh mì (vietnamese sandwiches). All of these entrees have a vegetarian option. On this night, as honestly, most nights we go there, I started with a glass of Sauvignon Blanc and Cathrine a Shōchū/soju Lemonade. For dinner, I ordered the Tofu Bún and Cathrine ordered the Mélange (steak, chicken, brisket, tofu, daikon, carrot) Phở. 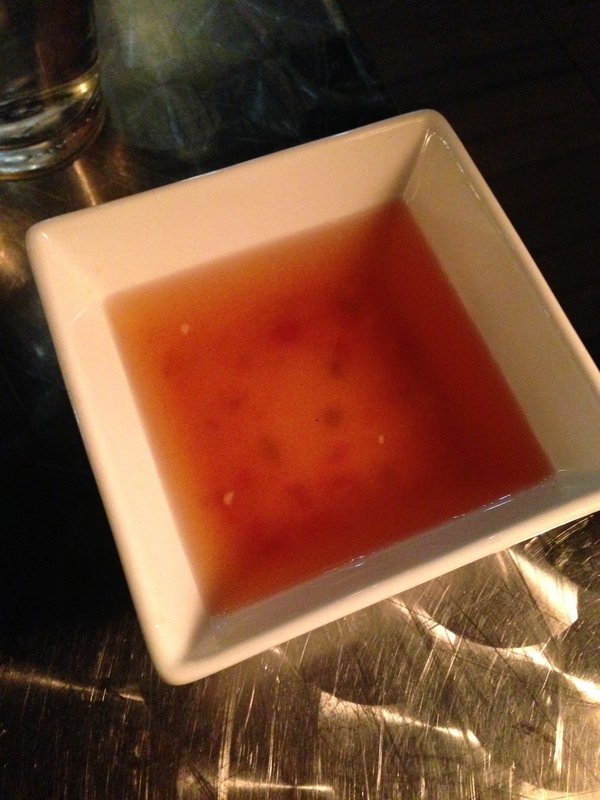 The Tofu Bún comes with this delicious sauce- it’s a combination of sweet and slightly spicy. Overall, it was a relaxing and enjoyable night out. I’m off to go do some birthday present shopping. Hope you all have a happy Monday! Has your city or town started to build parklets? Any interest in learning more about parklets and different designs? Sorry for being MIA for so long. We moved, unpacked to the point where it’s livable, and then played tourist in our own city when a couple friends from college visited. Our days during their visit were fun but boy were they full. Spending the day at Disneyland (and the gigantic cookies and cream ice cream cone I indulged in), the Warner Brothers Studio Tour, touring Robinson Helicopter Company, sightseeing around Portuguese Bend, and visiting the Bruery (Not to be confused with a winery, like I did. For some reason I thought it was going to be in a pretty setting. Instead it was adjacent to a freeway but my Sour in the Rye certainly made up for the lack of scenery) were some of the highlights of their visit. As with most visits, of course, it wasn’t long enough but I guess it gives us another visit to look forward to. 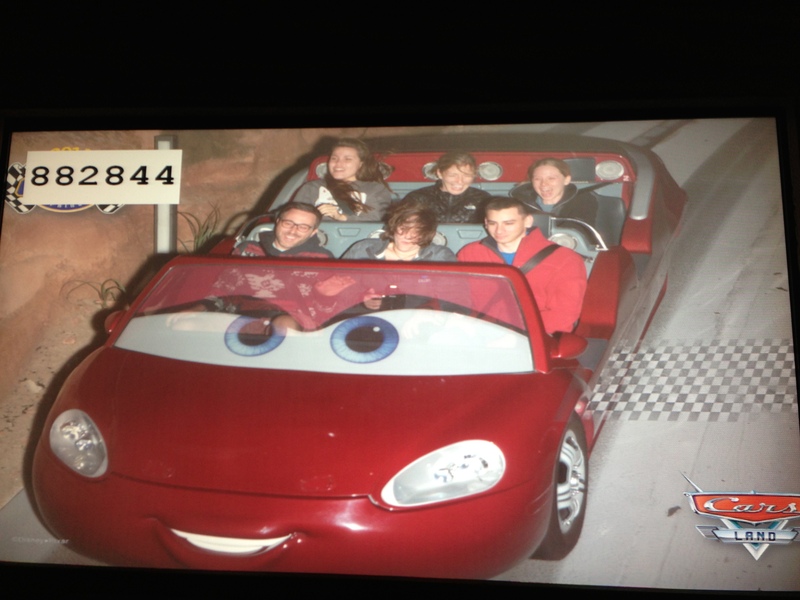 I will say, the Indiana Jones Ride in Disneyland and the Radiator Springs Racers (even though, the line was crazy long) in California Adventure were my favorite rides. 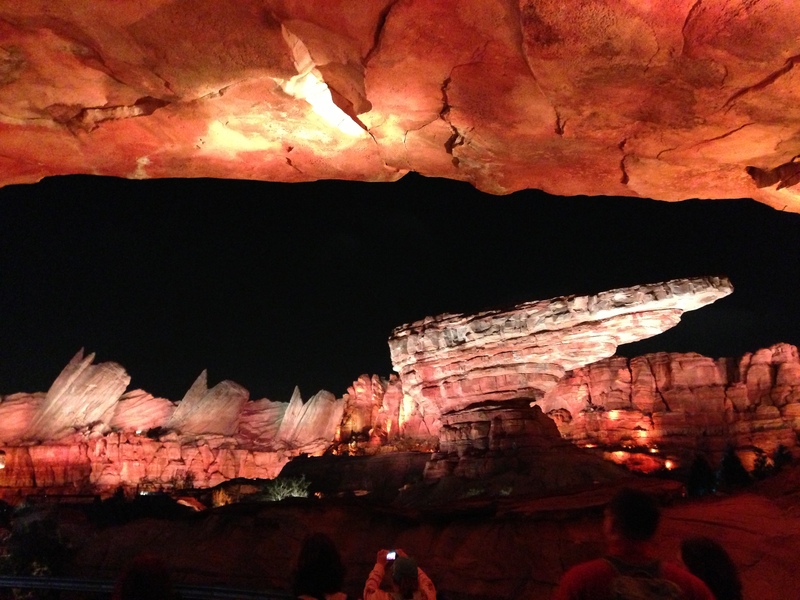 Check out the lighting of the Radiator Springs Racers ride at night! If you’re going to do it, I think it’s even more magical to wait until it’s dark. I love pictures of people riding rides! Did you know, Warner Brothers has over 2 miles worth of shoes!!! I’m not really a big television show watcher but I found just seeing the sets and how they can be transformed into many different types of scenes interesting. I would recommend going but the tours fill up so I would get your tickets before you go. Anyways, with moving and friends visiting, meal planning didn’t really happen. So, I happily looked through recipes and landed on some of our old favorites to make for dinner this week. We’ve had a rare three days of rain and I think this weather pattern influenced my meal planning. We’ve got lots of soup on the menu this week. Sunday- New Year’s Noodle Soup made with kidney beans instead of borlotti beans. I like the freeze our leftover soup for Cathrine to bring to work for lunch. Hope you all have a wonderful Sunday! I’ve off to make a simple brunch for us before starting the day. What’s on your menu this week? 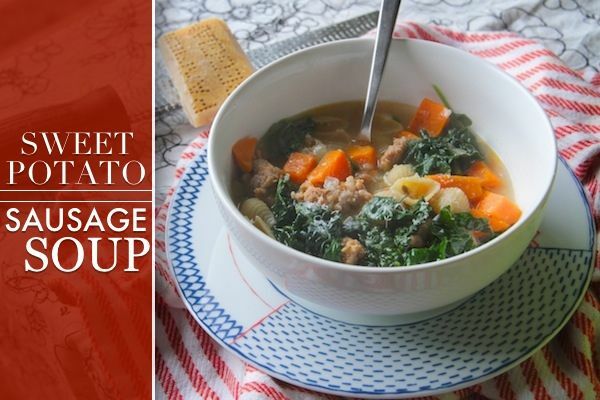 I thought I would participate in the weekly meal plan linkup this week. It’s my first time! I did our grocery shopping on Saturday and came home with three bags full of groceries. I had gotten in the habit of stopping at the grocery store throughout the week to pick up any extra groceries that we needed. Those multiple 10-18 dollar midweek trips can really add up. So, in an effort to be more aware of how much we spend on groceries and to first use what we already have, for the past couple weeks, I have been getting everything on the weekend. It’s been working really well! Especially with this new strategy, meal planning has been essential. 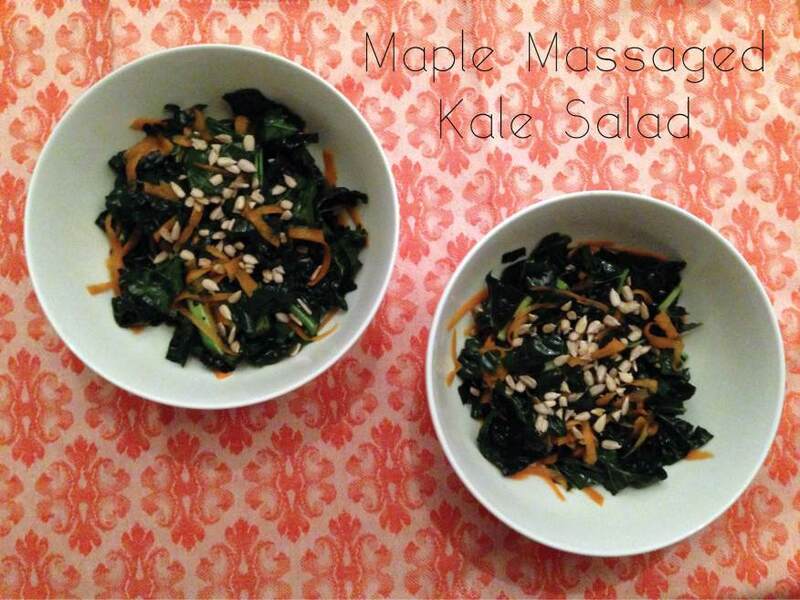 I’m linking up with mommyrunfast to share what we have on the menu this week! Friday- Orange-Maple Glazed Salmon with green beans, Mustard-Garlic Brussels Sprouts, and a massaged kale side salad (celebrating Valentine’s Day next week along with our 10 year anniversary). Oh what a week it’s been. We are moving soon and I started the process of packing and took a few car loads of boxes over to the new house. That’s one benefit of only moving two miles down the street (literally), you can make multiple trips. We have moved a lot since college, I think almost at least once a year (I graduated in 2007 and Cathrine in 2005) so that’s a lot of moves. But every time we start packing, I’m always amazed at how many things we actually own. Inevitably, we end up donating a few bags to Goodwill. On the bright side, moving is a time to pair down which always feels nice. But alas, it’s Friday now and time for my favorites! Since we are moving and will be decorating a house soon, I thought it would be fun to have this weeks favorites be all things that I’m loving around our home. 1. Spencer Peterman Cherry Bowl– We’ve given these bowls as wedding presents to a couple friends and were recently given one of our own. I love the story of these bowls, how the wood is found in the forest (near where I grew up) and the decaying tree trunks are turned into these beautiful bowls. 2. West Elm Favorite Throw– This throw is surprisingly warm since the material is relatively thin and cozy to curl up with on the couch. The price is reasonable (it’s even on sale right now) and looks nice draped on a chair or couch in the living room. 3. Loop Candelabra– We have two of these on our dining room table. They are fun, playful, and can be arranged in endless configurations. Sometimes I interlock them to create a cluster of candlelight in the middle. Other times, I separate them have them frame a flower arrangement. 4. Magnarp lamp from IKEA– We’ve had a version of this lamp for what feels like forever. We currently are using it as the light by the bed. They’re reasonable, simple to put together (which is saying something for the IKEA), sturdy, and I happen to like how they look. 5. Room and Board Parsons Bed Frame– Every time we move, I am thankful for this bed frame. It comes apart simply in four main pieces (headboard, foot board, two sides) and then 10ish (haven’t counted) rods that go across the bottom creating the platform for the mattress. All of the pieces are interlocking so there are not screws or bolts. We like it so much that we actually just ordered a second metal frame (different style) from Room and Board for our guest room. One of the reviews say they’ve had it for 18 years and it looks like they just got it yesterday. Boy do I believe them. I hope to be back later with a orange maple glazed salmon recipe. Perfect for an at home date night. This past weekend has full of many fun things! It was a combination of really busy and relaxation. Saturday morning I went on a 10 mile run, it was sunny and the temperature was perfect (slightly crisp) while Cathrine went to work for a few hours. Then we met at the barn and went riding, showered quickly at the house and headed to the Pantages Theater to see The Book of Mormon (hilarious!). Afterwards we inched our way back home (thanks to LA traffic) and continued our night with dinner out at a nearby favorite and watching The Heat which I may or may not have fallen asleep during. Luckily, I had already seen it. The past couple of weeks, we’ve been on a roll with watching our DVD’s from Netflix where we used to hold on to them for five months, now we’ve been watching one disc almost weekly. It’s been kind of fun! Sometimes it’s the simple things. Sunday was a rest day. Literally. I made a simple breakfast, meal planned and went grocery shopping, saw Armani (our mini), and did some food prep. It was a much needed quiet day. Lately, we’ve been going going going. 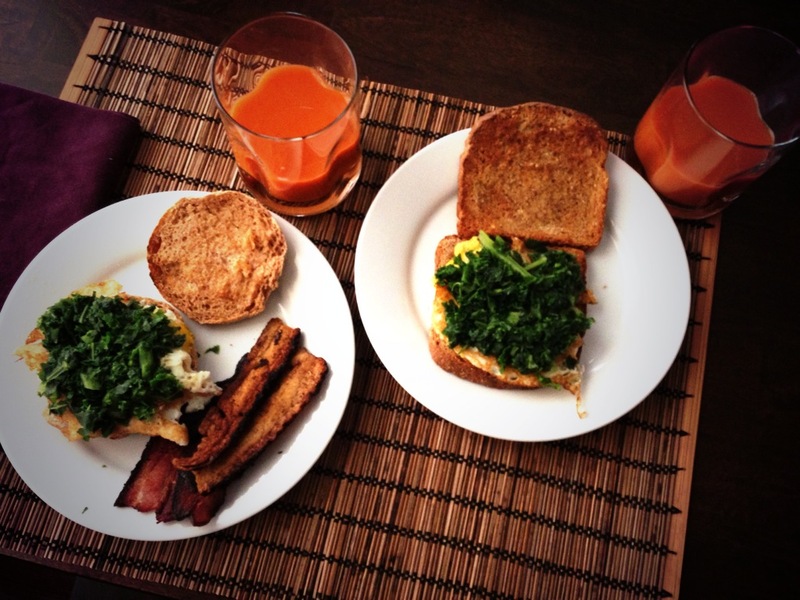 Breakfast was an egg fried in coconut oil, steamed kale, and Cholula on either an english muffin or whole wheat Ezekiel bread with a splash of carrot juice on the side. Cathrine also had one slice of black forest bacon and one of coffee bacon from Whole Foods. It’s her Sunday treat and she talks about it all week. For dinner, I made tostadas. 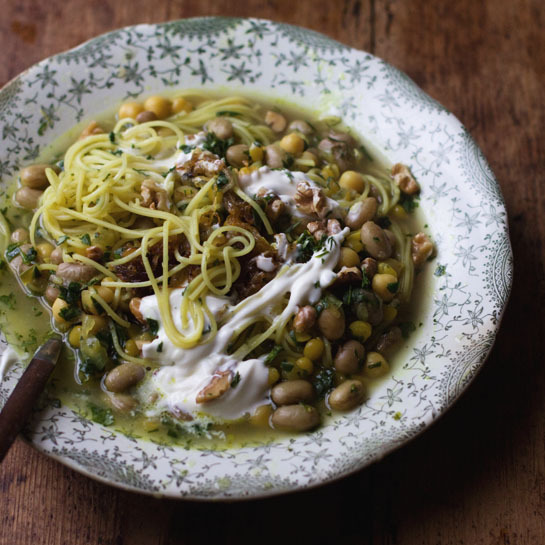 We really enjoyed them and couldn’t not share the recipe with you. 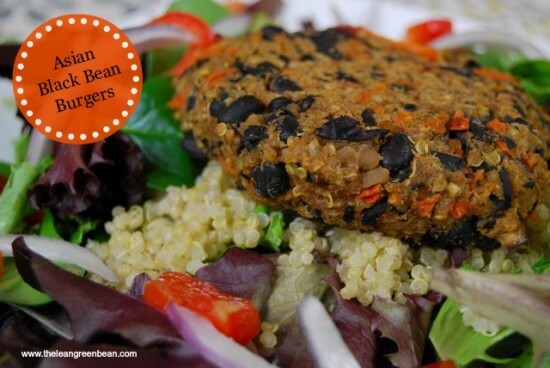 They have protein from multiple sources, a variety of vegetables, and tons of flavor. Preheat oven to 400 degrees. Spray olive oil in bottom on glass baking dish. Peel and cut sweet potato into 1/2 inch pieces and place in baking dish. Sprinkle with cumin and chipotle (to taste). Roast in oven for about 40 minutes. Stir occasionally. Cut broccoli into bite size pieces and set aside. After the sweet potato has been roasting for 40 minutes, add broccoli to pan and roast an additional 10-12 minutes. While the sweet potato and broccoli are roasting, dice garlic and add to saute pan along with some coconut oil (to prevent sticking). Turn the stove on medium to allow coconut oil to melt. Add shrimp and saute until the shrimp are about half cooked. Add torn pieces of chard leaves. Cover and cook until the shrimp are done and the chard is wilted (stir occasionally). Meanwhile, place two corn tortillas on a baking sheet. Once the sweet potatoes and broccoli are done, divide them between the two tortillas then evenly distribute the black beans. Place in oven and let bake for about 10 minutes (until beans are warm and broccoli is fully roasted) at 400 degrees. Check periodically. 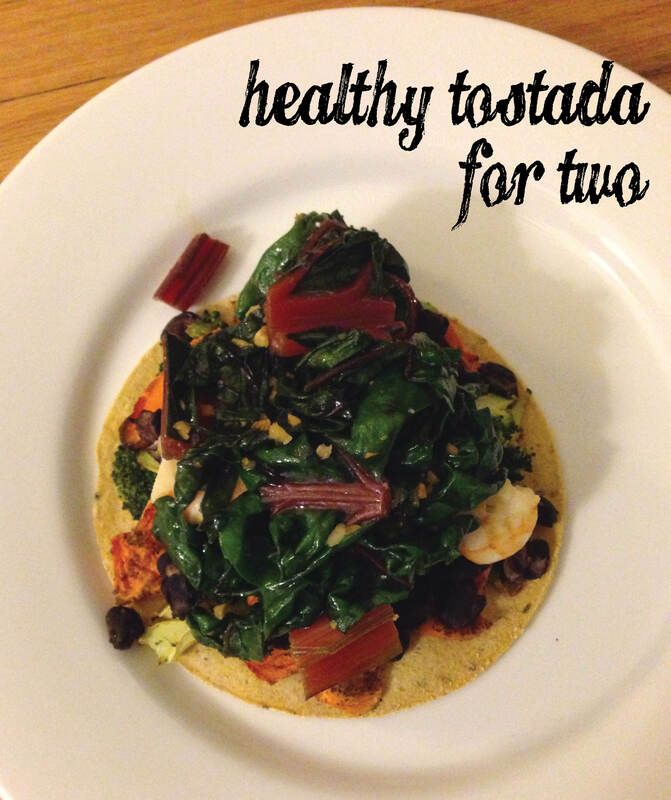 Then top each tostada with cooked shrimp and chard, sprinkle with Cholula if you like some heat, and enjoy. My mom heard on the Today Show that it takes 60 days to form a habit. When she first told me this, my initial thought was, “boy that’s a long time,” but then I considered it a little more and began to believe it. All too often we want to see immediate change without putting in all the required effort. All too often we make changes and reason with ourselves that these changes are possible because of their short duration (3-4 weeks) and once the time passes and the goal is reached, we’re more than likely to go back to a modified version of our previous behaviors. Changing habits for the long term is hard. Starting new habits that last is difficult. For me, getting into the habit of blogging has been hard. While this blog has been around for more than 60 days, honestly, I have not been dedicated to this space. It will be hard, it will take work, but for the next 60 days, I’m going to try and make blogging a habit. Moving on, here’s a list of five things that I’m loving lately! 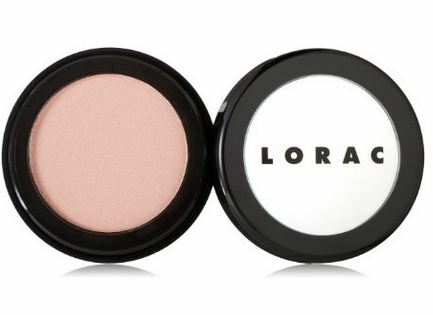 Lorac Blush in Soul has been my go toblush for a while now. It’s actually the only blush I own. It gives just the perfect amount of rosiness to your cheeks without looking too bold. My makeup routine, if you can even call it a routine, is very simple. Some moisturizer, sometimes a tad of BB cream, a little bit of this blush, mascara, occassionally a spritz of perfume, and lip gloss. I prefer a natural look. Olive Natural Beauty Lip Balm in Refreshing Rosemary if the perfect lip balm for during the day. It smells wonderful and leaves your lips feeling amazing. Plus it’s handmade! Wallaby Organic Nonfat Greek Yogurt and Stoneyfield Organic Nonfat Greek Yogurt. Until three weeks ago, any type of yogurt used to make me gag. But lately I’ve been loving having a bowl every day. It’s a good source of calcium and protein. I like to top mine with raw oats, unsweetened coconut flakes, and chia seeds. MaraNatha Organic Crunchy Peanut Butter has been a staple in our fridge for the past few weeks. I enjoy mine spread on top of a banana for breakfast and Cathrine likes it on celery for an afternoon snack. My parents gave me The North Face Thermoball Full Zip Jacket in Black for my birthday a couple weeks ago. It’s finally chilly enough in So Cal that I’ve been able to wear it. It’s so cozy and light but warm that I never want to take it off. Hope you all have a wonderful weekend! We’re headed to see Book of Mormon on Saturday!